I find eating typically lighter meals when it's cold outside is a struggle. Like, who really wants a cold salad over something warm, carby, creamy, meaty, and comforting? You know what I mean? The downside is that eating those heavier meals at lunchtime makes me just want to take a nap; not a good thing when there are deadlines to meet. Thus, I've been finding a happy medium by making hearty yet healthy fresh veggie wraps for lunch. This smashed white bean one was such a winner I just had to share it with all of you. 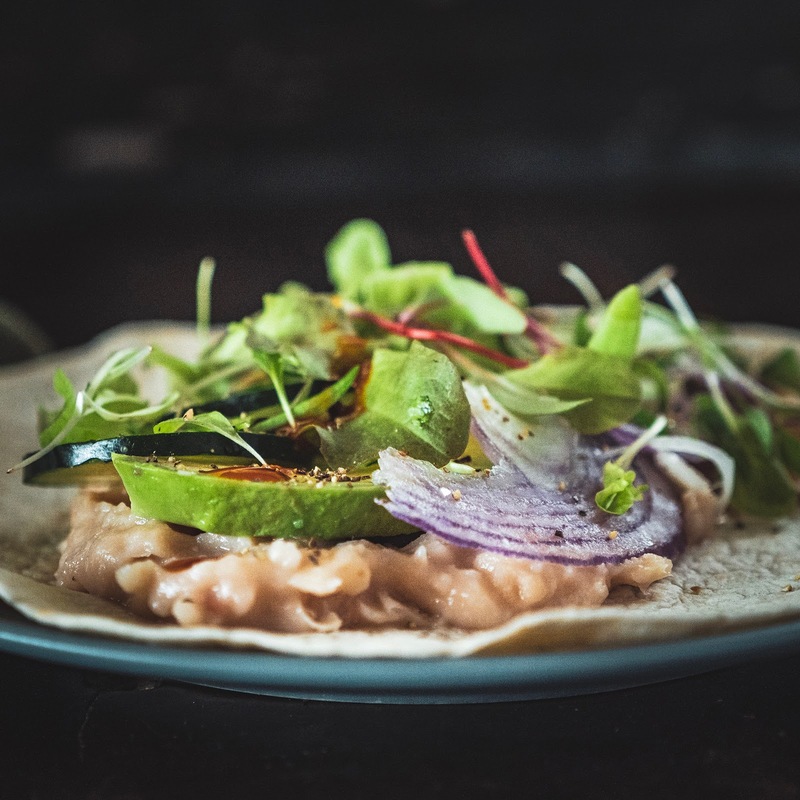 Boy did the package of La Tortilla Factory Non-GMO Low Carb Flour Tortillas in the soft taco size from this month's Degusta Box come in handy as I embarked on my mission to eat fulfilling yet fresh lunches this week! A few fun facts about La Tortilla Factory: Founders, Jose and Mary Tamayo, set out to bring authentic Mexican flavors to California in 1977. They developed and launched the first Low Carb Tortilla in 2002. They were also the first to market with a flexible gluten free tortilla, and an organic tortilla (way before organic was cool). They pledge to use real ingredients; no weird stuff like dough conditioners, and mono and diglycerides. 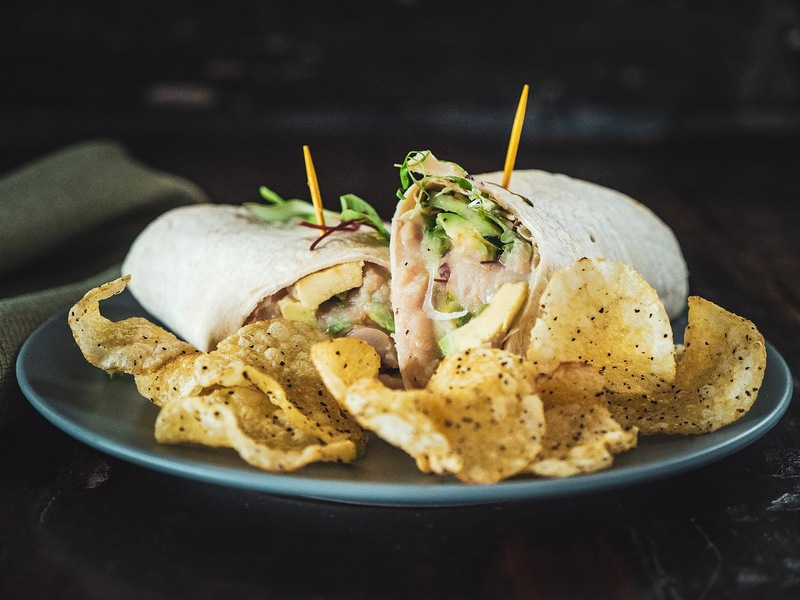 This wrap is completely inspired by a recipe for a smashed white bean and avocado club sandwich that I'd torn out of a Real Simple magazine circa 2006. Do people even still do that? Pull recipes out of a physical magazine? I feel like I'm totally dating myself here. Any way ... I swapped the bread for the low carb wrap and swapped the sprouts for Gilbertie's Petite Edibles (Westport, CT) Citrus Blend, which is a combo of microgreens - citrus basil, chervil, chard, beets, sorrel, lettuce, and amaranth. Then, to top it all off, I added some heat with Sweet Baby Ray's Hot Sauce, also from my January Degusta Box. It was a little more fulfilling to eat, at least to my brain, than a salad when it's below 10 degrees outside, but not so heavy that I needed a nap at my desk. Oh, and those chips in the above photo weren't just props. I ate 'em all! In a medium bowl, combine the beans, garlic powder, salt, and pepper. Roughly mash the mixture with the back of a fork. Lay the two tortillas out flat on a cutting board and divide the mashed beans evenly between them. Top with the onion, cucumber, avocado, and microgreens. Splash on some hot sauce if desired. Roll each wrap and secure with toothpicks. Enjoy.